How efficient is it? Well, if you were take a fully charged Toshiba Encore WT8 (20Wh) and a fully charged Changers power pack (16Wh) you’d be able to surf the Web, at a productive speed, for about 15 hours. Add the Solar Panel and you should be good for a full 8hrs work every day that the sun shines. 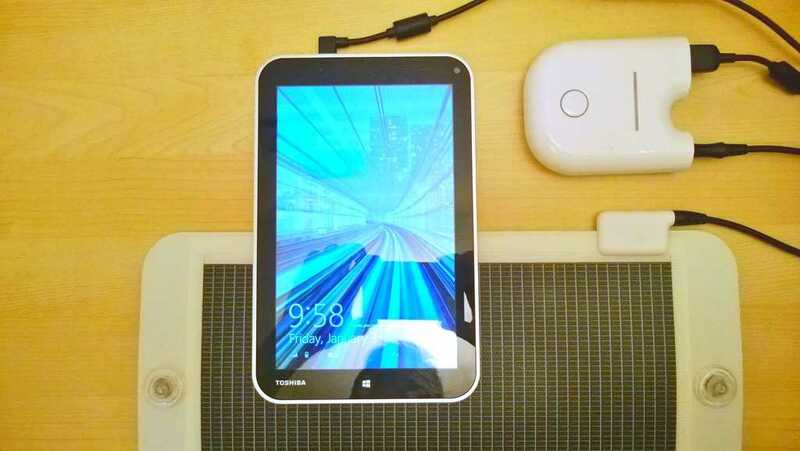 The platform underneath this tablet is the new Intel Baytrail platform which introduces a new architecture over the older ‘Clovertrail’ Windows 8 tablets that I was testing during 2013. Its as efficient, but about twice as powerful. Web browsing speeds will comfortably beat most, if not all Android and IOS tablets out there while offering connectivity and application flexibility that will probably never be possible on an IOS or Android device. This is a smartPC! It’s dark here as I dust off my Changers solar kit (Recommended. Review here.) so I won’t be starting tests tonight and as it’s belting down with rain outside here in early Jan it may be a few days before the sun comes out. At that point I’ll start a few tests. I’ll add a Bluetooth or USB keyboard and mouse and run some applications. The tablet requires a 2A feed for fast charging but I’ve seen some 1A chargers working. 1A, 5V is more than enough to keep this thing topped up and with a 5W panel, even the battery pack might remain charged. If it all works out, I see no reason why I can’t attempt another Solar UMPC tour. 8-inches is quite small for productivity but having worked for 10 days with a 7-inch 800×480 tablet in the past, I don’t see many issues here. If it’s not the size for you though, take a look at the other options available on the Intel Baytrail platform. They go up to 11-inches but of course the screen backlight requirements go up a lot. Keep the screen size as small as possible. Stay tuned here, on my YouTube channel, over at UMPCPortal or Twitter for more on this new generation of ultra-efficient PCs. iPhone 6 With Solar Charging: What’s the Reality?